Unfortunately, most of these are processed foods that make healthy diets difficult, but I have included all key snacks for the sake of completeness. Snacks are a good way of spreading nutrition through the day, but they should make a healthy contribution to your diet, not spoil all the work you have dome in eating healthy meals. The best snacks are small portions of fruit and vegetables, maybe with some nuts and whole grains. 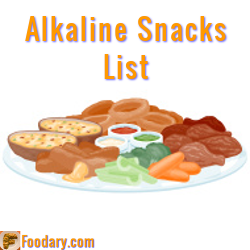 The alkaline snacks list shows all the foods from snack-related food groups listed in PRAL order. You can click headings to sort by a different column, and repeat clicking reverses the sort order. Click links above the table columns for more explanations. As you can see, snacks cover a wide range of food items, some of which are not very healthy. High salt content is a common problem with many processed snack foods. Many are small meals that really belong in a recipe section. A searchable database of recipes is on the cards for Foodary, but for the next few months I will be concentrating on basic food items and health issues. If you have any questions, experiences, or opinions about alkaline snacks, please join the alkaline snacks list discussion.